for Monday, April 8, 2017. The market is trending down. Market trend is slowing, changing direction or nontrending. The markets are in an uptrend. Take new long positions. What Does Each Signal Mean? Signals a market downtrend. Taking new long positions should cease until the market direction changes. If you're comfortable shorting, a red signal is a good time to do so. Signals a possible change in direction or a nontrending environment. Stop taking any long or short positions until the markets indicate a trend direction - unless you have a specific short-term strategy. 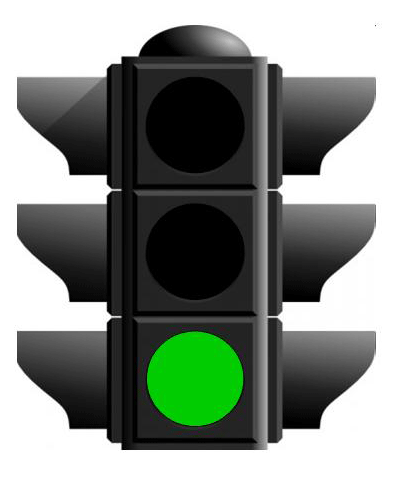 A yellow signal can also indicate a volatile market which is difficult to trade in successfully. Signals an upward trending market. Taking new long positions is acceptable. Short positions should be avoided when the market is in an uptrend. Why Should You Care About Market Direction? The reason to be concerned with market direction is that it gives you an opportunity to take advantage of the direction the markets are moving. Trading with the trend direction will give your trades an additional boost. Additionally, the idea is to enter new positions during a trend to buffer any downside movement as well as take advantage of any momentum in the markets. How is the Trend being Read? The trend is being read using several indices: New York Stock Exchange ($NYSE), NASDAQ Composite ($COMPQ), Dow Jones Industrial Average ($INDU) and the S&P 500 ($SPX) which is a good index to use for reading the general market trend because of the broad range of stocks that are included in the index. The indicators that are used are the Average Directional Index (ADX) along with the ADX's +/-DI and moving average lines. Price and volume also play a role. Great question. First, I look at the market direction every day, and it's a fairly simple exercise to the trained eye. If you're just learning how to read market trend it's an easy way to follow along. Secondly, I want to encourage you to return to Stock Trading Warrior frequently to check on the market's direction, perhaps sign up for the Stock Trading newsletter (the opt in box is in the right column of this page toward the top), click on or investigate a product or service you find here on the site. Or, do all three! How Do I Learn How to Read Stock Market Trend? If you're interested in learning how to read stock market direction and trend on your own please read Look at Stock Market Trend Before You Buy Stocks. This webpage introduces some good technical indicators to use for reading market direction and some other indicator tools that can help determine the mood of the markets. Return from Stock Market Direction to Online Stock Trading Warrior Home.